A Chadian diplomat has accused its neighbour, Sudan, of invading his country and destabilising the region. Chad's ambassador to Ethiopia said Sudan was to blame for repeated aggression in his country since 2004. Maitine Djoumbe said the African Union should have the courage to condemn this and called for immediate intervention. The Chadian government has declared a state of emergency in the south-east where escalating violence has forced some 70,000 villagers from their homes. Emergency water supplies in eastern Chad are overstretched and may not be able to meet the needs of thousands of people fleeing fighting in the area, linternational aid agency Oxfam warns. The agency said that at least 20 villages had been attacked by men who appeared to be ethnically Arab, in incidents that mirrored what had been occurring just across the border in Sudan's Darfur region. Eastern Chad and Darfur have a similar ethnic make-up and the two governments have swapped charges of backing rebels. Mr Djoumbe told the AU's Peace and Security Council that he wants the organisation to adopt a resolution calling for the government in Khartoum to stop all hostile flights over Chadian airspace, to stop its invasion against Chad and to stop providing support to rebel groups. "This is not an internal Chadian conflict as some persons believed. It is an invasion of Chad by Sudan and Africa should be capable of calling on the government of Sudan to put an end to it," he said. "It is a planned destabilisation of the entire central African sub region and the AU should have the courage to condemn it." He said repeated aggression since 2004 was inevitably intended to undermine the peace, security and stability of the continent. But Sudan's government refuses to permit a robust UN peacekeeping force to relieve an over-stretched African Union contingent in Darfur. "This is not the time to prevaricate or to seek to prevent the conflict between Khartoum and N'Djamena since it already exists," the ambassador said. The BBC's Amber Henshaw in Addis Ababa, home to the AU's headquarters, said the session broke up with no resolution. But the Peace and Security Council said they would call another meeting to hear from the Sudanese government about these accusations. In April, Chad rebels reached the capital, N'Djamena, before being repulsed. 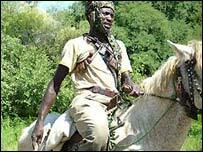 Sudan denied claims it had backed Chad's rebels, while Chad denied supporting the black African rebels in Darfur. Some two million people have been displaced in Darfur and at least 200,000 are estimated to have died in the three-and-a-half year conflict. Sudan's government says it is disarming Arab militias, known as Janjaweed, who have been accused of carrying out genocide on its behalf.